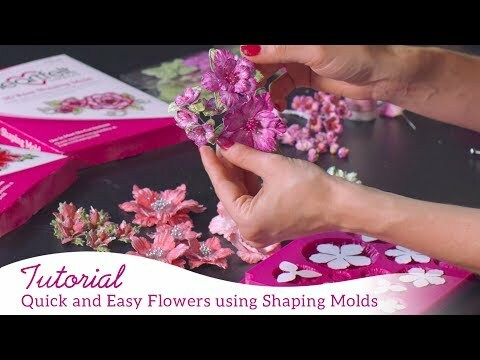 For more tips on creating with the Camelia Carnation collection, watch the tutorial at https://youtu.be/rhk76SAIgWQ. Instructions: To see more photos of this project, click here. The finished size of this project is, 4.33in x 6.29in (11cm x 16cm) Taking the McDonalds hot chip box, make a pattern by tracing around the form onto the photocopy paper with the pencil. Cutting into the box folds as you go to be able to trace the details of the folds and curves. Make also a pattern for the front matting for use later. Make a pattern for the tags; this is the size of the back of the box made a little smaller but longer. Taking the Kraft cardstock, trace the pattern onto this then cut it out. Trace all the curved folds onto the Kraft card stock using the smallest balling tool from the flower shaping tool kit. Using the score-pal for any straight folds needed. Gently bring the curved folds into the cardstock. Adhere the box together by looking to the second box to see the placement of adhering. Apply peeled paint distress ink to all the folds and edges of the Kraft cardstock box. This box has 8 tags. They are made to different lengths so when finished the lace is seen on each tag. Once the tags are cut from Kraft card stock, find the patterned paper wanted for the tag fronts. Cut these the same size as the tags. Using the paper-distressing toll, distress all the paper edges. Taking the lace die from the Festive Holiday Doily die and the white card stock. (1x doily for two tags) The doily is cut in half in the length, saving any off cut swirls for use in decorating the front of the box. Both pieces are used. Ink the doily pieces with the broken china and peeled paint ink. Adhere the doily pieces to the top of the tag. Adhere the distressed design paper tags to the Kraft tags. To make the scripture sentiments, use each one of the scripture texts found in the sets Words of encouragement and Words of comfort onto white cardstock. Find an oval that will fit and die cut the stamped image. For each oval sentiment, cut 4x extra from the white card stock to make oval chipboards when the layers are adhered together. Once the ovals have been adhered together, apply ink to the edges with peeled paint distress ink. Adhere to each tag, a completed oval sentiment. To decorate the box front: Find the design paper with a blue tint that matches the project cut the front matting with the aid of the matting pattern already made. Distress the edges with the paper distressing-tool. Adhere to the front of the box with wet glue or double-sided tape. Adhere the ribbon around the top of the box. Make a full bow and adhere to the left of the box on the ribbon line. Taking the scripture based stamp with " I am complete in him" stamp this with the coffee archival ink. Find the circle that fits the sentiment and die cut. Die cut 4x extra and adhere these circles together to form chipboard. Apply peeled paint distress ink to the edges of the circle once the adhesive is dry. Adhere to the box front center. Taking the carnation, leaf stamp, and matching dies make 3x carnations by stamping with the archival coffee ink then die cutting. Each carnation has 5x petal layers, 7x leaves. Bring shape to the carnations using the mold as seen in the video above in the instructions. Stamp three carnation buds from the Fanciful Carnations stamp and matching die sets. Bring color to the leaves and buds using the Peeled paint ink for the leaves and Victorian velvet ink for the carnations. Taking the saved off cuts from the lace doilies, trim away any unwanted details to make a swirl. Arrange and adhere the carnations, leaves and swirls as a cluster, between the circle and the right foot of the box.